Recently, I've been on the lookout for quick & easy, yet totally indulgent home spa treatments. 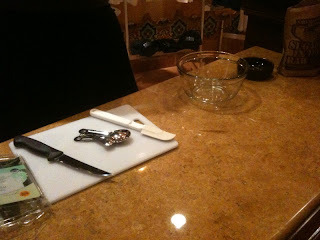 Recently at the Pacific Waters Spa Mom Blogger event (at the Hyatt Regency Huntington Beach) we were shown how to make these wonderful home treatments... Enjoy! Mix the food ingredients in a small bowl. Apply in light circular motion on desired area. Wrap area lightly in plastic wrap for approximately 10 minutes. Remove plastic wrap and rinse treated area thoroughly in warm shower. *The coffee is stimulating, an anti-oxidant, cleansing, deodorant & detoxifying. The Coconut butter melts at body temperature. It smooths skin, is an excellent emollient and lowers evaporation for the skin. Mix all ingredients in a medium bowl. Apply to feet in light circular motion to exfoliate and soften calloused areas. You may wrap feet lightly in plastic wrap and warm towels for 3-4 minutes. Unwrap feet and rinse feet with cool or warm water. *The Aloe gel is soothing and healing. The Peppermint/mint improves energy, calms nerves, clears/stimulates mind, aides in concentration, helps with motion sickness, headache and nausea. The Sugar assists with exfoliation. 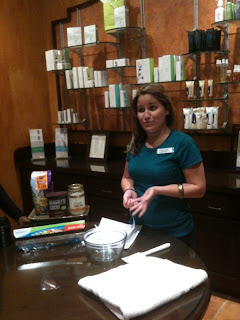 Want to read more about my recent visit to the Pacific Waters Spa? Go here. As moms, don't we all need a few minutes to take care of ourselves? These in-expensive and easy to do at home treatments are a great way to pamper yourself when you don't have the time or resources to book a Spa Day at the Pacific Waters Spa! Come back and let me know if you try one of them! ** Please note I am not a doctor and none of the above are meant to diagnose or treat anything. But the information is relatively commonly known.